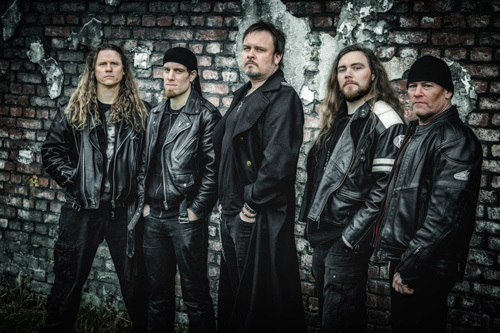 Germany's Wolfen makes their return with their sixth studio effort, Rise Of The Lycans. 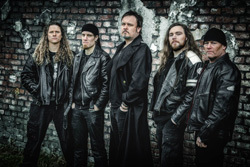 The album features the return of drummer Sigfried Grutz and the arrival of second guitarist Andreas Doetsch to the wolf pack. What hasn't changed is Wolfen's commitment to classic thrash infused power metal. Their musical formula is both familiar and predictable: start with thick and thrashy twin guitar riffage, throw in a galloping pace driven by the beefy rhythm section, and then race to the brisk and fiery guitar solos. Much of this started with the last album Evilution. But the problem with that album was that it was heavy on the power thrash metal, and light on melody and harmony. This time around both have improved. The guitar riffs are still intense and tough, yet with more harmony. Taking their lead from the vocal line, both the guitars and rhythm section are picking up on the subtle melodies. Additionally, Wolfen has put more rock groove into their power metal, another good thing. You'll hear all these improvements in songs such as Rise Of The Lycans, Timekeeper, and Genetic Sleepers. Another notable song is New World Order, which has an excellent bass and drum start before twin guitar harmony drops in. Then the song turns more on moderate and traditional heavy metal pacing. With Science & Religion you get a light electric guitar start before developing into another steady, riff sturdy, heavy metal tune. All said, for Wolfen, as compared to their previous album, Rise Of The Lycans is a new and better album of their thrash infused power metal, thanks to a greater infusion of harmony, melody, and groove. Recommended. 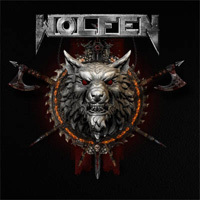 For Wolfen, as compared to their previous album, Rise Of The Lycans is a new and better album of their thrash-infused power metal, thanks to a greater infusion of harmony, melody, and groove. Recommended.